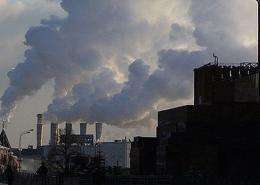 Steam from a power generating station billows in Moscow in 2009. A Russian waterworks has recruited giant African snails to act as living sensors to monitor air pollution from a sewage incinerator. A Russian waterworks has recruited giant African snails to act as living sensors to monitor air pollution from a sewage incinerator, the company said Tuesday. The waterworks is using six snails as an innovative way to monitor pollution from a incinerator that burns sewage residue on the outskirts of Saint Petersburg, the Vodokanal state utilities company said in a statement. The Achatina snails, which reach 20 centimetres in length and are widespread in Sub-Saharan Africa, were chosen because "they have lungs and breathe air like humans," the company said. The snails have been fitted with heart monitors and motion sensors while breathing smoke from the plant and their readings will be compared with a control group, waterworks spokeswoman Oksana Popova told AFP. While living organisms are frequently used to monitor pollution, an expert dismissed the use of snails to monitor the controversial incinerator as a publicity stunt. "I don't know if snails get cancer, but even if they do, it won't happen straight away, and we will not hear about it from Vodokanal." Artamonov said that last year Vodokanal refused Greenpeace access when activists wanted to take a water sample at the sewage treatment facility, which is one of the biggest in the country.